This week’s Thought for the Day was a last minute swap with another presenter, and in the midst of a plethora of world events, the Creative Fool’s eye was caught by a story about an Icelandic anti-littering project. You can read the full story here, you can hear the Thought here at 1:23:19 and below you’ll find the script. And if you keep listening, you’ll also hear a wee bit of singing from sports presenter, Phil Goodlad. This week we learned that a brightly coloured yellow float had washed up on the east coast of Tiree. The heavily encased bottle, which carried a GPS tracker, was one of two dropped into the seas off Iceland in January 2016 by a children’s TV programme. Its purpose was to demonstrate to viewers that rubbish tossed into the ocean doesn’t disappear, but can travel miles to cause problems on the other side of the world. 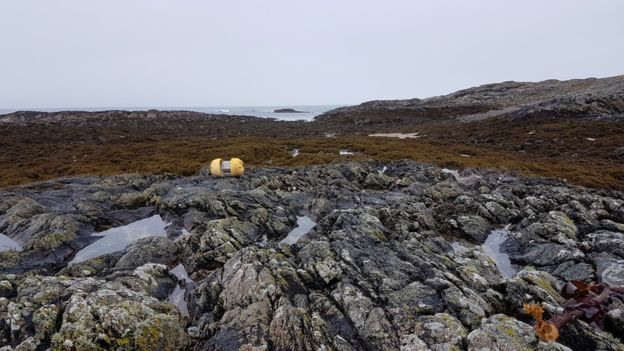 The team who launched the device anticipated that it would end up in Norway, but, as though designed to prove the point, it didn’t follow predictable patterns and, after being tracked around Greenland and off Canada, eventually washing up in the Outer Hebrides. Those of us who grew up singing along to The Police know that the way to send an ‘SOS to the world’ is to pop a message in a bottle and thrust it into the waves. And anyone who’s ever tried to send one, knows it’s a risky business. A carefully composed note might end up buried on a distant beach, undiscovered and unread. But there’s always the hope that your corked bottle will connect you to someone on the other side of the world. The premise of the Icelandic project is right. All actions have consequences, and not just our littering tendencies. Our decisions, whether on a personal, national or global scale, have an impact on other people and our own future. Like an unpredictable yellow float, the lies we tell, the deeds we hide or the damage we inflict on others might remain undiscovered, but more likely will turn up at a later point to cause problems. At the heart of the Christian faith is the confident belief that God is both just and merciful. It’s this that sets us free from the fear that our actions can never be forgiven. Casting our burdens onto Jesus brings forgiveness and a fresh start, and this hope can keep us steady when life feels uncertain and chaotic. Rather than sending an SOS to the world, to quote another line from the song, only hope can keep me together.